Penicillium is a group (Genus) of moulds found everywhere world-wide. It is the mould that saved millions of lives by producing the first ever known modern antibiotic, the penicillin. The discovery of penicillin from the fungus Penicillium chrysogenum (then known as Penicillium notatum) by Sir Alexander Fleming in 1928, perfected the treatment of bacterial infections. The name Penicillium comes from the resemblance of the spore producing structures (conidiophores) of the fungus to a paintbrush (penicillus is the Latin word for paintbrush). They are found in soil, decaying vegetation, air and are common contaminants on various substances. Penicillium causes food spoilage, colonizes leather objects and is an indicator organism for dampness indoors. Some species are known to produce toxic compounds (mycotoxins). The spores can trigger allergic reactions in individuals sensitive to mould. Therefore, the health of occupants may be adversely affected in an environment that has an amplification of Penicillium. About 200 species of Penicillium have been described. They are commonly called the blue or green moulds because they produce enormous quantities of greenish, bluish or yellowish spores which give them their characteristic colours. Spores from this species of mold are found everywhere in the air and soil. As mentioned earlier, Penicillium species are one of the most common causes of spoilage of fruits and vegetables. For example, P. italicum and P. digitatum are common causes of rot of citrus fruits, while P. expansum is known to spoil apples. Penicillium chrysogenum is the most common species in indoor environment. It is widespread and has a wide range of habitats. In indoor environment, it is extremely common on damp building materials, walls and wallpaper, floor, carpet mattress and upholstered furniture dust. It produces a number of toxins of moderate toxicity. It is allergenic (i.e., it can trigger allergic reactions). 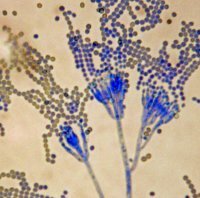 Some species of Penicillium can also infect immunocompromised individuals. For example, P. marneffei is pathogenic particularly in patients with AIDS and its isolation from blood is considered as an HIV marker in endemic areas. It has emerged as the third most common opportunistic pathogen among HIV-positive individuals in Southeast Asia where it is endemic and infects bamboo rats which serve as reservoirs for human infections. Penicillium species other than P. marneffei are commonly considered as contaminants but they are also known to produce mycotoxins. For example, P. verrucosum produces a mycotoxin, ochratoxin A , which is damaging to the kidney (nephrotoxic) and could be cancer causing (carcinogenic). The production of the toxin usually occurs in cereal grains at cold climates but has been isolated in buildings contaminated with Penicillium. Other mycotoxins include patulin, citrinin, and citroviridin among others. Many species of Penicillium are important in biotechnology, food, medicine, biodeterioration and other applied fields. So, correct identification of these species is of vital importance. Microscopically, Penicillium species are identified primarily based on the branching habit of the conidiophores the species exhibits. Conidiophores can be simple or branched. Details of Penicillium identification are beyond the scope of this article. 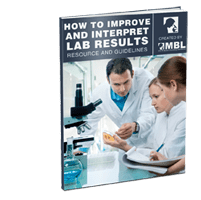 However many commercial labs are incapable of correctly identifying Penicillium to species level. If you have questions or need mold testing and identification services, please contact us by phone or email.